With 21 vessels due to arrive at DBCT and only 15 vessels due to sail between now and next Friday we expect an additional 6 vessels in the line-up by this time next week.. Berth #2 / Ship-Loader #2 No vessels scheduled for loading 07 April – 17 April. Berth #3 / Ship-Loader #3 is operational. 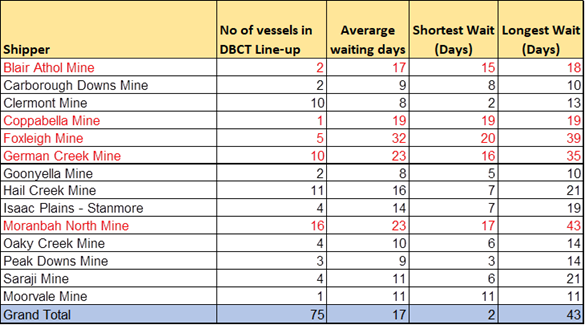 Average days for vessels currently scheduled at DBCT is 17 days. Please note Berth #1 / Ship-Loader #1 at BMA Haypoint is also under maintenance until 16 April .